Bulk bag unloaders are particularly useful in instances where the bags were taken from storage because materials may have become tightly packed over time and much more difficult to unload manually. Not only useful for a variety of materials, bulk bag unloaders can also be used with a wide range of bag sizes and styles including lined, unlined, polypropylene, mesh, wicketed, gusseted and perforated. At times, bulk bag unloaders may also be used for flexible containers. As a cost-effective and safe means of unloading bulk bags, bulk bag unloaders are often used in industries such as industrial, chemical and food processing, construction, commercial, foundry, mining, and pharmaceutical. 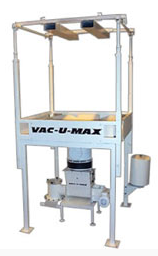 Bulk bag unloaders are typically a fairly simple construction to which many accessories may be added depending on the requirements of the application. Bulk bag unloaders mainly consist of a frame, a hopper, bag support, suspension loops attached to the bags, and an outlet chute. However, there are many different frame configurations for bulk bag unloaders, the most common of which include forklift style and chain hoist style. Fork lift-style bulk bag unloaders have pockets that allow for a forklift to easily load bulk bags into the bulk bag unloader. 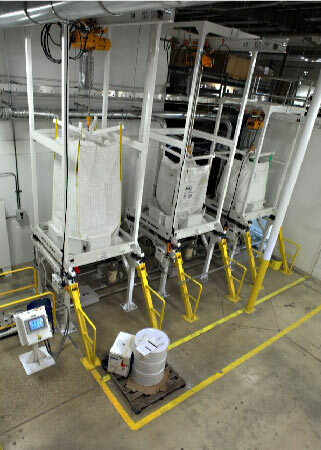 This type of bulk bag unloader is generally shorter than a chain hoist style bulk bag unloader because it eliminates upper framework necessary to lift or position the bags. A chain hoist-style bulk bag unloader enables loading of the bags without a forklift, integrating a pneumatic or electrically powered hoist that allows an operator to lift, position, and support the bag for loading. A less common style of bulk bag unloader is crane style. A crane style bulk bag unloader uses a crane in much the same way that a forklift would be operated to load bulk bags. Bulk Bag Unloaders Bulk bag unloaders, also known as bulk bag dischargers, provide efficient powder handling or discharging of other dry bulk materials from bags that were used to provide storage or easy transport for otherwise difficult-to-handle materials.